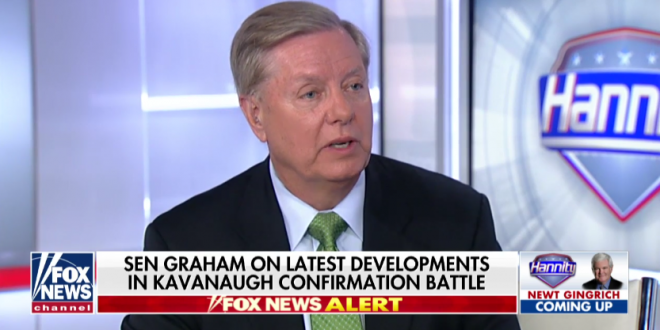 Linsdey Graham: If Kavanaugh Is Voted Down, Trump Should Renominate Him After The Midterms [VIDEO] - Joe.My.God. “Here’s what I would tell the president: I would appeal the verdict of the Senate to the ballot box. This good man should not be destroyed. If you legitimize this process by one vote short, we’ll be on to the next person. I’d hate to be the next person nominated. I would feel horrible that we destroyed Kavanaugh. So what would I do? I would re-nominate him and I would take this case to the American people. “I’d ask voters in Indiana, in Missouri, in North Dakota and other places where Trump won – saying who he would nominate if he got to be president — and see if the voters want to appeal the verdict of their senator. “This would be an appeal from a political body to the people who put us here and see if these Trump states that elected President Trump to do exactly what he’s doing on cutting taxes and appointing conservative judges, if they’re OK with the decision of their senator.” – Lindsey Graham, last night on Hannity.